The digital era has become inundated with the idea of anonymity as on the Internet where users create avatars in forums and write without obvious material constraint; however when considering documents such as graphic novels and print fiction, the figure of the author remains a nostalgic figure which grants validity to the document. In classic comic book collections such as Watchmen and Batman: Year One by Alan Moore and Frank Miller, the original scripts by the authors are included in special editions in both print and Kindle format. But these “original” script pages are shrouded in forms of anonymity as they illustrate signs of digitization, either through scanning or during production and thus display various visual clues, such as errors, which relay levels of realness. Furthermore online versions of these script pages, found on fan website databases and authors’ blogs, are complicated by the anonymity the Internet and digital editions produce. Therefore a digital forensics methodology is used to interrogate these script pages in both print and digital format to create an ordering system for digitally manipulated text. It also endeavours to illustrate the possibilities for a forming digital forensics field by using various technical calculations and recreations of text with original software and hardware. Online versions of text, whether accessed through Kindle files, downloadable pdfs or blog postings, illustrate the changing modality of humanities research that enables new parameters for examination and discussion of non-traditional material. Scholars have begun to study digitized classical texts and images, such as scans of William Blake’s artwork and Shakespeare’s folios; however, there exists a gap in discourse: comic books/graphic novels. Though Internet-moderated collections of digital comics have existed for years, the availability of and discussions about the value and production process of digital comics are substantially more accessible with the recent growth of the Internet [Norcliffe and Rendace 2003]. Digitally produced and circulated graphic novels and their accompanying secondary texts present new challenges for analysis, particularly regarding the formation of approaches to digital media and its popularization in mainstream culture and academia. Digital forensics is an approach that investigates the ways in which digital data is stored and transmitted on devices and traditionally utilized by “business, industry, government and military” [Palmer 2002], yet is also emerging within the arts as a productive means of inquiry. Associated actions include retracing keyboard strokes, recovering data and passwords through decryption, and creating and comparing files in order to understand how data and its encasing were constructed [Palmer 2002]. Matthew Kirschenbaum (2008) considers this in Mechanisms: New Media and the Forensic Imagination , stating that digital forensics is “commemorative as well as judicial, and fundamental to the arts as well as the sciences ” [Kirschenbaum 2008]. Employing the digital forensics methodology to the arts requires a flexible subject; various versions of graphic novels that have either been digitally reproduced or formatted within a digital file provide an example of such “crystallizing at the nexus of storage, inscription and instrumentation”. In this study, [Kirschenbaum 2008] uses the example of floppy disks that contain video games, and the magnetic engraving upon them, to practice a type of digital forensics, allocating attention to the physical qualities of the magnetic ribbon and retrieving electronic data from discontinuities on the ribbon’s surface. This article illustrates a modified digital forensics methodology, utilizing both original print and digital graphic novel texts as case studies to analyse digital/print authorship and the associated Internet network through the appendices, with primary focus on digitally reprinted typewritten scripts by graphic novel authors Frank Miller ( Batman Year One ; Daredevil ) and Alan Moore ( Watchmen ; The Killing Joke ; From Hell ), as well as unofficial digital versions disseminated on the Internet. The digital forensics methodology employed includes reproducing texts manually, statistically calculating characteristics and using scholarship from multiple fields to understand the ways in which digital texts imitate original sources. While section two contextualizes the connections between print and capitalism, section three examines the probability of scanning marks and page alignment in Miller’s Batman: Year One by comparing similar documents and calculating letters’ pixel ratios. The fourth section offers a contrasting view of digital comic scripts that derive from word processing programs and, as such, requires different parameters such as encryption and stylistic blocking for validation. 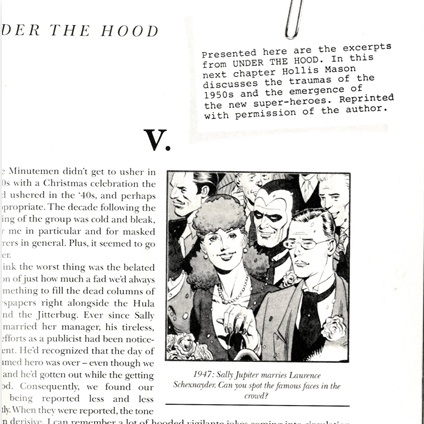 Fake comic books scripts are introduced in section five, examining their presence in Moore’s Watchmen where conscious choices to include misalignment and typing errors illustrate the ordering systems used by authors and publishers to recreate authenticity. In this section, the digital forensic method includes recreating the actual script on a typewriter and calculating probability of errors. Section six uses the methodology to interrogate blog postings of Moore’s scripts and questions the blocking as well as capitalization of words. It also considers the user comments and whether the Internet breeds or credits authenticity. Conflicts surrounding legitimacy and anonymity of digitally manipulated scripts propagate through these texts by levels of realness presented to the reader by ordering systems, such as errors. The term “realness” represents the perceived value of authenticity by the user, i.e. whether something is believable as existing in present reality according to the reader. This evaluation of competency and credibility is one of the requirements of a digital forensics analysis [Palmer 2002]. This article attempts to articulate modern conceptions of digital reading as well as digital writing through the interrogation of the ordering system regulations that appear and their associated credibility. The discourse network which is produced and substantiated by these digitized graphic novels involves complex connections between capitalism, visualizations, technology, anonymity, authorship and nostalgia; I believe that what an analysis of this network or archive reveals is how the conditions surrounding a digital text, not the text itself, produce our ability to access and frame such a discourse network, as well as the figure of the author in the digital era. Within the past few decades various comic book authors have achieved celebrity status and characters have been integrated into North American mythology, witnessed by the popularity of movies such as The Dark Knight and The Avengers as well as events such as Comic Con. Converted consumers who were not previously exposed to comics as well as lifelong avid fans are expressing interest in the creative process and the figure of the author, driving multitudes of publishers to include original scripts, drawings, and notes within digitally reproduced reissues and collective volumes. These additional scripts and notes constitute the paratext, e.g. that which surrounds the main body of text; traditional examples of the paratext include appendices, publishing marks, covers, and footnotes. Within academics and publishing, Joseph Bensman (1988) argues that “footnotes have important institutional, ‘political,’ and aesthetic functions” [Bensman 1988]. Appendices and paratextual elements, specifically typewritten comic book scripts, also occupy this space within the graphic novel’s statements. The aesthetic and institutional effect of the graphic novel’s paratext has been used as a source of profit by companies who increase the price of special reissued editions because of it. The celebrity status of authors and inclusion of the new paratext reflects the fetishization of these scripts and the increasing aesthetics currency value. Typewriters are similarly fetishized [Kittler 1999], connoting nostalgic images of previous eras and linking text with monetary value. Nostalgia, which is the rubbing of past and present [Hutcheon 1998], lies in the discourse network around the typewriter that recalls specific political, cultural and domestic memories. Famous author’s typewriters and the associated works have been sold for higher market price as collector’s items as seen on websites such as Etsy and Ebay. Further typewriter models and authors are fetishized by the innumerable copies of images on websites and secondary publishing, becoming almost pornographic as they are worshipped by fans and objectified [Wershler-Henry 2005]. Secondary objects emerge, such as typewriter bedspreads and fridge magnets which are sold by in vogue companies such as Urban Outfitters, but the images are all licenced through the original publishers and estates. Thus a large commercial network is formed around the print text and is paralleled by the economy of comic books. Alteration and commercialism both contribute to the objectification of the comic book authors and their associated texts; therefore, this article focuses on providing both a contextual and mechanical reading of the digitized scripts. Beyond social implications, the creation process of modern comics allows a secondary layer of analysis, as comic books are now produced on digital interfaces. Digital production of comic books with current text and image processing software programs, such as Photoshop, Adobe Illustrator and InDesign, alters the discursive statements of a text, evidenced through the shifts of the paratextual digitized additions like script pages. Digital editions of comic books, such as Kindle versions, include hyperlink connections to publisher’s websites connecting readers to the origin and to the Internet where they can interact with other users through the comments section. These new paratextual features are presented as novel entities that increase the entertainment value of comic books and alter the discourse network. Further, the paratext is what enables the companies to market nostalgia as the modern world (i.e. the Internet forums) is contrasted against the old world represented by the typewritten scripts. When DC Comics decided to revitalize its superheroes in the mid 1980s, writer Frank Miller and illustrator David Mazzucchelli created Batman: Year One , a graphic novel retelling Batman’s origins [Reichstein 1998]. Because of its impact and popularity, a reissue released in 2005 included additional paratext in the form of a new foreword, afterword and never-before-seen original script pages, which the jacket cover describes as providing “a glimpse into the making of this contemporary classic” [Miller 2005]. These additional paratexts are marketed as a selling feature on DC’s website where the graphic novel is listed as one of the best sellers under the fan favourites section heading (Fan Favourites DC). In Gerard Genette’s (1997) definition of the paratext, it serves to reveal or provide information for the reader, both through immediate text such as jacket covers and through text later formulated, such as a critical reading. The graphic novels’ paratext sets not only the context for the content in the foreword, but produces narratives that function externally to the main text, a modern parallel to hypertextuality seen in the afterword and typewritten scripts. Furthermore these scripts convey the relationship between romantic authority of the pre-contemporary typewriter, essential in the modern creative process, and Internet-associated anonymity. Although the realness of the scripts is contestable, they highlight the fundamental modality of acceptance that society employs toward printed text as opposed to digital text seen extending from the historical introduction of the printed bank notes, creating a “currency of ‘trust’” [Robertson 2013]. 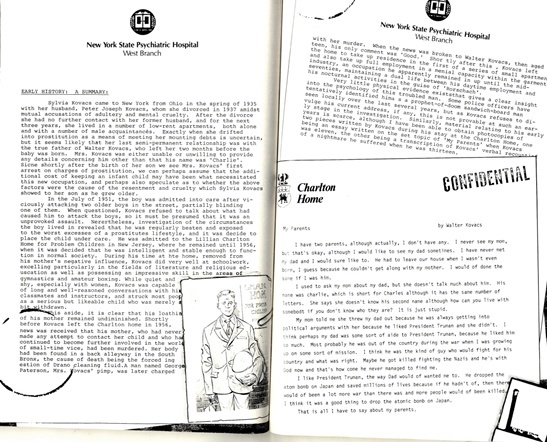 In the new, digitally reproduced afterword, four smaller script pages are printed and are seen in Figure 1. Craig Dworkin comments on the use of symbols such as dashes and ellipses, where the “symbols must be viewed; they cannot be spoken without some contrived act of translation.” [Dworkin 1999, 62] Here the scribbles, underlines, and X’d out letters similarly cannot be spoken without the reader consciously integrating their own proclivities into translations, and thus reiterations for different readers are found in the prosody of the text. The ephemeral quality of the script then is configured into this construction and furthered as not every panel matches the caption perfectly. These interventions associated with InDesign contribute to anonymity of authorship and act as a product of the collaborative nature of comic books, eroding the notion of the singular author figure and contributing to the multiplicity of the network that is emblematic of contemporary Internet user interactions. This dialectic between author as romantic notion and author as multiple/anonymous, which is a product of the digital experience, continues throughout the examples, illustrating tensions underneath consumption and creation of digital textual products. An opposing example is witnessed in Frank Miller’s Daredevil: Volume 1 which portrays a realistic typewritten script that is entirely digitally created. Seen in Figure 2, graphic artists have used programs such as Photoshop to create residue scan marks in the corners and mimicked typewriter typeface. However, several indicators such as sizing, borders and text uniformity ultimately reveal the text to originate from a digital source. 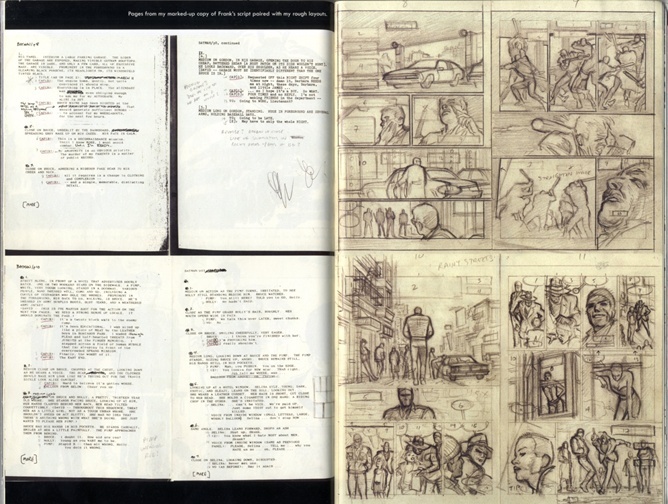 Several of these issues are displayed in the text of Miller’s Batman: Year One scripts. Figure 3 illustrates an example of where errors and text uniformity reveal the realness of a text and the extent to which it has been digitally manipulated. In choosing to display marked-up text, the pages subsequently conceal as much as they reveal. Typewritten overlays exert authority of authorship while also succumbing to it. The gesture of the typewriter is that it forces the writer to think before typing in order to avoid errors [Flusser 2009]. The Xs and ink scratches in Figure 3 are effects of the gesture of typewriting, and thus produce the ephemerality of these drafts presented to the consumer. Conversely, word processors allow the user to edit as they write, conflating the experience between writing and editing, erasing the totality of the author. The typewriter’s editing process is complicated by the fact that these pages are digitally reproduced. The implication of the text’s digital and physical qualities is exemplary of the tensions between consumption and creation, illustrated by the scanning/photocopying process. Evidence of scanning is exhibited in the black borders on the top and bottom of the four quadrants of script grids in Figure 1, which are consistently parallel with the borders of the novel, yet the borders of the actual scanned pages overlap at inconsistent angles. Questioning the mistakes, such as border alignment and errors, produces ambiguity surrounding the validity of these digitally recreated documents and the author. If these documents were key to the novel’s commercial success, normal assumptions would be that DC Comics would have ensured these documents were scanned properly or at least Photoshopped straight. The misalignment is a reflection of how typewritten documents assert authority and authorship in a digital era; it becomes important that these pages are misaligned to show the traces of the digital process in order for the readers to ascribe these pages with a value of realness and relinquish the anonymity of the collaborative author. Within the alternate script pages, closer scrutiny reveals a difference of typeface between individual pages, characterized by the consistency of the letterings’ width as well as the shade of the page seen in Figure 4. Typeface one uses heavy ink and follows the shape of stereotypical typewriter script while the second category of typeface has less consistency of boldness and elongated letters more similar to electronic typewriters or word processing output; however the scripts appear together as if they were composed at the same time in random order. Technical instructions with words “medium” and “close” are examples of phrases that appear within the two types of scripts and illustrate key differences between them. The ratio of height to width for the word “medium” in the former typeface is 6.57±.001: 1 pixels, while for the secondary typeface is 7.83±.001: 1 pixels. Therefore by analysing the specific heights and boldness, there is a definitive difference between the script pages that results in part from digital manipulation. In the case of questioned typewritten documents, professional forensics experts used ink bleeds and letter boldness to determine the veracity of a text [Lacy 1946]. In this instance examining the scanning process as well as the writing process illustrates the digital forensics methodology, whereby questioning the composition and reception paratextuality reveals how digital modification alters textuality through nostalgia and commercialism regarding modern typewritten scripts. The paradox involving nostalgia, authorship and commercialization is challenged by online script leaks where whole communities of fans have, through various means, obtained versions of the scripts and posted them to websites. One of these websites, The Comic Book Script Archive , has a copy of the first twelve pages of Alan Moore’s The Killing Joke as a 2007 Microsoft Word document, seen in Figure 5. Alan Moore/Tim Simmons, The Killing Joke . Word Document Version of Script. The lengthy descriptions, direction of panel size and placement and overall style is reflective of a real Alan Moore script [Ellis 2000b]. But it is contained as a Microsoft Word document that anyone could have created, and thus anonymity abounds. The conflict between anonymity and authorship provides a complex relationship to capitalism and ownership. On websites such as DC’s Kindle site, the main source of sales is the special edition text, while on sites such as The Comic Book Script Archive , ad space and donations constitute the site’s income. In this case the script is perhaps more authentic since it is not objectified for monetary value; however, it embodies another type of value, ownership. The procurer retains so-called bragging rights and is able to claim ownership over the document. Therefore this network belongs to a different set of motivations and statements that centre on currency involving ingenuity, ownership and resourcefulness as well as publishing and authenticity. Other forms of scripts include faxed documents, blog postings on author websites and actual documents emailed by the authors themselves. The community around the scripts acts as a secondary paratext to the documents, which in turn are also paratextual. The Internet versions from the archive are removed from the primary discourse network as they have endured other forms of translation and modification as well as existing without the same value expectations. These expectations alter the approach of a digital forensics methodology, shifting focus on ownership rather than commercial value. 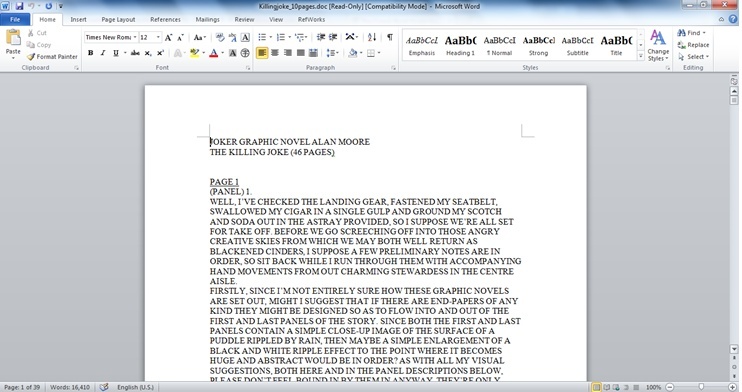 In the Microsoft Word document of The Killing Joke , Moore’s name appears within the first line, but when examining the document’s properties the owner is Tim Simmons who is the website moderator (2012). This immediately alerts the reader that this document has either been modified on Simmons’ computer or it has been entirely created by him and the romantic notion of authorship is disrupted by the digital precepts. Furthermore the document is not locked and therefore it is possible for any user to modify the document. Within this document are grammatical and structural errors, which Microsoft Word highlights, but the reason why the author did not fix these mistakes appears as two choices: that the original script contained these errors, or that the transcribing author made these errors. Errors enter the discourse surrounding authorship, but unlike the scan marks they blur as well as clarify the rules and signification around the author figure. The ambiguity surrounding these errors recalls the ambiguity within transmission of text online as demonstrated by Alan Liu. [Liu 2004] discusses the process by which the separation between the first user (writer) and second user (reader) results in the ambiguity of intentions. Although he refers to the structure of a poem and the directions that need to be issued as to how to reconstruct it after digital transmission (email), his argument about the need for structure and rules is applicable in the case of errors. In print, errors and marks act as ordering structures which delegate specific sets of texts to specific genres and formats to authors, but in the digital culture they create an enigma of anonymity. The properties of The Killing Joke document reinforce this type of anonymity and speculation over truthfulness. Within the digital realm errors aren’t enough to confirm authorship; it is encryption, the website authority and the document ownership which provide a more complete understanding of authorship. Alan Moore and Dave Gibbons’ Watchmen , originally published in 1986, presents the reader with several types of typewritten and published text. The narrative of the story is told in three modes: one being the journal of Rorschach, the text of a pirate comic, and the third through a narrator presenting excerpts from a superhero’s autobiography as well as informational pamphlets and medical records. The autobiography is of Hollis Mason, one of the original superheroes within this fictional representation of America in the 1980s, and has been reprinted for the reader with conscious awareness of the circumstances. 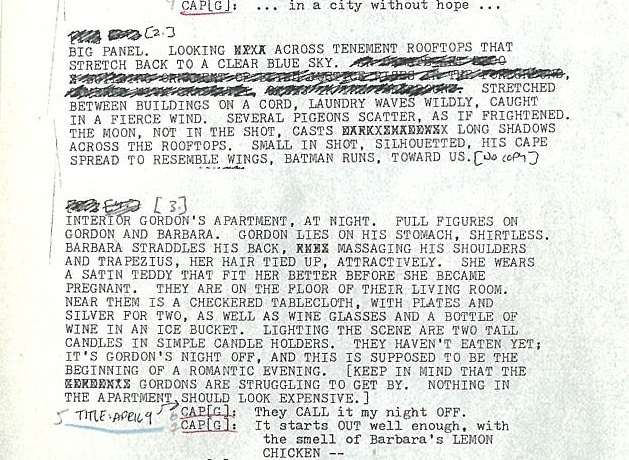 Although the reprint is not in traditional typewriter Courier font, indicating word processing, there are notes that have been attached to the top of each page in typewritten script seen in Figure 6. Alan Moore, Watchmen . Attached notes to the script pages. In an example of an excerpt from the fictional autobiography, the note reads: “presented here are the excerpts from UNDER THE HOOD. In this next chapter Hollis Mason discusses... reprinted with permission of the author ” [Moore 2005, 23]. The note supports the romantic notion of print authorship from the logic that in order to reprint permission is needed of a singular person. But overall authorship belongs to the creators of the graphic novel, who in turn created both the note and the autobiography. Therefore the digital confuses notions of authorship as it allows creators the ability to overlay notes and paperclips in realistic fashions with program such as Photoshop. Although originally written in 1986 this new version was recoloured and scanned in 2004, which allowed for the modification of depth ratios present in the overlay image. The uniformity of the note’s letters is similar to the uniformity of false text at the end of Miller’s Daredevil: Volume 1 as the letters in the notes have no inky bleeds, smudges or even scan marks. The attempt to present this evidence as truthful to the typewriter is noticeably exemplified in the slanted alignment of the notes and the sections of text that are interrupted by physical page boundaries. The projection of authority and knowledge through the note is supported and subverted simultaneously by the interruption of these physical constraints. This fractious union is representative of the implications that stem from recreating typewritten text in a digital format as the typewritten text searches for constant validation but is never justified in contextual meanings. It is the form and physicality that produces its associations with power and authority within the digital. One of the more realistic portrayals of typewritten text comes at the end of chapter six, with Rorschach's criminal records, psychiatric evaluations and letters. 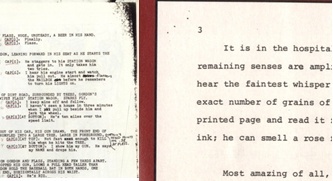 Attempts to assert the typewritten page as real come from visual clues such as coffee stains, stamp marks and errors, seen in Figure 7. Alan Moore Watchmen. Various spelling errors and marks create realistic text. Through the police report and evaluation the subversion of authority and knowledge is witnessed in misspellings and clerical errors, such as in the middle of the report with the word “neretheless” [Moore 2005]. This mistake illuminates the process of creating a realistic fake document. In misspelling “neretheless,” there are actually two errors: the first error is the forgotten “v,” the other the reversal of the “r” and second “e.” The “v” is on the bottom row of the QWERTY assemblage, common to typewriters and computers, therefore it is unlikely that it would have been switched with the “r” two rows above. This conclusion is supported by the quantitative model purposed by Neil Kay’s (2013) equations for the typewriter’s probability of conjoined letters. The reversal of the “e” and “r” appears much more common, as these two are frequently paired together and are located beside each other on the QWERTY keyboard layout [Kay 2013]. This manipulation and romanticised notion of the typewriter is supported by the existence of other errors throughout this psychiatric evaluation, which include three main types. The first is the reversal of letters with examples “scine” (since), and “hte” (the); improper spacing in “short ly” (shortly) and “hima s” (him as); and addition/subtraction of letters in “decide” (decided), “eduscation” (education) and “forced ing” (forcing) [Moore 2005, 30–31]. Therefore it indicates the salient precept that errors and misalignments exist in order for a printed text to assert its validity as belonging to reality. This dictates a template for errors; specific mistakes or glitches signify a real text of non-digital writing just as certain marks or disruptions signify a scanned page. This idea is perpetuated in Alan Moore’s (2008) The Killing Joke afterword, where a short narrative tells the story of a man creating a hypothetical killing of Batman. The status and authority of the author, as well as the digital, are encoded within it. The man videotapes his confessions and ideas and thus the words are translated into the realm of the digital. By portraying an author in a digital context, the idea is subversive in its stance towards our understanding of the figure of the author as cult status romantic image. It conflates the time of writing and producing, erasing part of the gesture of writing as the modern writer “is born simultaneously with his text” [Barthes 1977], just as digital word processing conflates writing and editing. This erasure is not in totality; it indicates a shift in the notions of the author and the creative process which must now be considered in the digital era. By using a digital forensics methodology which examines the spelling errors and small page markings as well as larger contextual instances, a developing type of research is witnessed. The decentering of research disallows a simplistic understanding of meaning or authorial intent and instead focuses on the materiality as well as the ramifications of the text. [Jameson 1991] argues that fandom is now beyond the classical sense and that the height of American consumption is in the “technology of reproduction itself.” This can be applied to the discourse surrounding reproduction of scripts and texts on Internet forums and sites that compile various editions. Through a weekly column published online, graphic novel author Warren Ellis engages with questions about the industry, the process of creation and notions of authorship. Ellis cites examples of different artists’ formatting techniques and styles, including types of word processing programs and digital inferences. Many styles use a screenplay type structure with some authors preferring screenplay software, such as Celtx, while other authors manually format their scripts in Microsoft Word [Ellis 2000a]. The implications of different techniques as well as technology affect the discourse around them, causing social orders to form around the techniques, such as the famous Marvel method. On the artist Eddie Campbell’s personal website, his collaboration with Alan Moore, From Hell , is posted in various fragments. Campbell has reproduced Moore’s original script through the confines of the Internet webpage, raising questions of authorship as Moore originally wrote the text but Campbell has posted it online thus producing anonymity about the true author. The popularity of From Hell , due in part to the consumer driven culture mediating it, has spurred this release of scripts, which are transitory moments of creation and are encoded in the html of the webpage. Inconsistencies fill the script posted by Campbell; in one panel’s directions “NO dialogue” contrasts the following panel with “No dialogue” [Campbell 2006b]. The inconsistency of capitalization hints that the script appearing online has been translated between files or physical mediums. Each panel description is written in all caps, similar to scripts previously witnessed earlier in this article and illustrated in Figure 8. Eddie Campbell and Alan Moore, From Hell . Screenshot of online posting of the script. [Campbell 2007b] discusses this as characteristic of Moore’s style and cites Dave Gibbons on this technique: “If you type the description in upper case, you can just put the caps lock on and bash away, without worrying about the niceties of capitalization at the start of sentences. Having dialogue in lower case differentiates it from the description, obviously. More importantly, it means that you can use caps for bold and don't have to bother going back and underlining. It's a typewriter thing.” By identifying a typewriter mentality comparative to digital writing, the digital edition loses authorial power for the reader scrolling through reproduced scenes. On further posts Campbell [Campbell 2006a] has scanned Moore’s photographs which were taken to create real life references for the collaborators and contain Moore’s handwriting, giving direction to Campbell. All of these different forms of media assemble on the website to instruct the reader on the creative process, but the reader’s interactions will ultimately be varying just as the website changes itself. It is never revealed to the reader if these are finalized versions, intermediary versions, or just correspondence between the two collaborators and the ephemerality of the scripts becomes integrated into the increasing ephemerality of the digital. There is no definite time mark attributed to these pieces except for the posting date, nor is there context for how each post was actually created. For example, did Campbell retype the script on Microsoft Word and copy and paste it into a WordPress text box, or did he type it directly into html of the webpage? Changes in the coding between html and Microsoft Word can alter the text itself and thus the lack of information about composition subverts the notion of authorship by creating ambiguity about authenticity and translation. I was reading through January and saw the photo you posted of your work as "low-brow art" - this links to a picture of From Hell in the main Freemason's library in Washington, DC, which incidentally is open to the public and a magnificent collection. Feel free to use the pic as you see fit. Off-topic for this post, I'm afraid, but I use blogspot too, and I know how hard it is to see comments after they move off the main page. This post reconfigures the work and its discursive statements while creating a link to other media-based networks. Other users respond to this comment and thus the network grows; however, not all responses relate directly to this topic and the network behaves as a rhizomatic function. Value is displaced as “Mike” is possibly a pseudonym and unrepresentative of the true, real life author and his associated knowledge. There are no academic associations or a definitive value system for assessing the validity of Mike’s claims without following the link provided, and nostalgia functions in a different context than previously witnessed in print forms. The projected desire to witness evidential proof of realness echoes through these documents and is manifested in part by the anonymity associated with the digital era, e.g. Internet communities. It functions through nostalgic relations and associations but ultimately transfigures the relationship between writer and text through the digital. Errors create not only organizational patterns but emotional imprints. Sentimentality of errors galvanizes identification of authors; it makes them human and relatable, something which is in opposition to the anonymity the Internet offers. By simplifying discursive rules to sets of errors, authors past appear easier to access as cult figures than those of the future who manuscripts are purely digitally composed. Moore now uses Microsoft Word to create his scripts (2000a), but his process is kept invisible by comic book publishers, thwarting transparency of authorship. The Internet offers an alternate possibility for writer-reader interaction by allowing this transparency to pass at the risk of anonymity. The errors and marks leave traces just as emails are stored and inscribed [Kirschenbaum 2008] and are indicative of the possibilities that digital forensics produces. What a digital forensics reading of these images offers is insight into the production process and the types of implications scanned or recopied typewritten scripts offers. It also establishes how digital text asserts authority in comparison to printed work. In both examples it is in the conditions around a text, not the actual text itself, which mediate our experiences with nostalgia, capitalism and subjectivity through the digital realm. Adobe 2014 “InDesign CC – Features,” Adobe. (2014) Available at: http://www.adobe.com/products/indesign/features.html[Accessed 5 January 2014]. Barthes 1977 Barthes, R. Image, Music, Text. Hill and Wang, New York (1977). Bensman 1988 Bensman, J. “The Aesthetics and Politics of Footnoting” International Journal of Culture, Politics, and Society 1.3 (1988): 443-470. Campbell 2007a Campbell, E. “From Hell 5/26”, Eddie Campbell Blog. (19 February 2007) [Online Blog Post] Available at: http://eddiecampbell.blogspot.ca/2007/02/from-hell-526.html [Accessed 10 February 2013]. Campbell 2006a Campbell, E. “Alan Moore’s London. 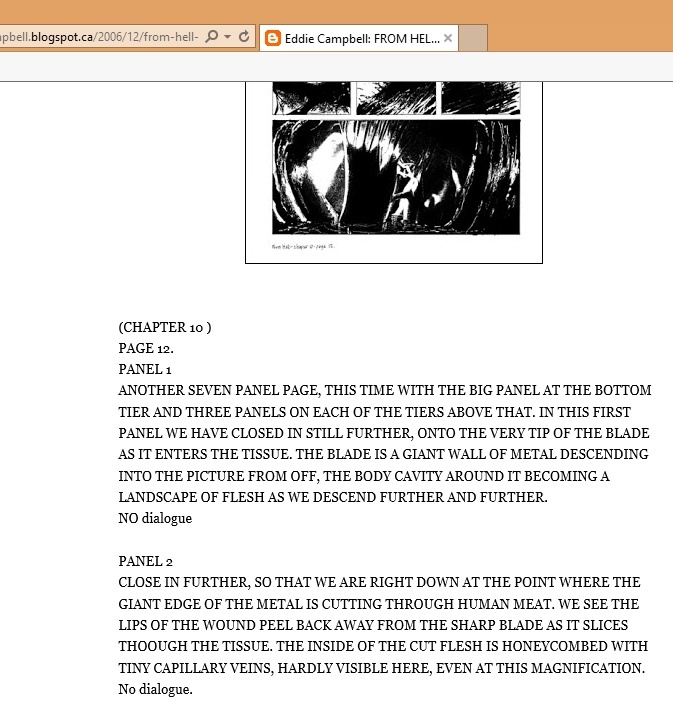 Part 1”, Eddie Campbell Blog. (21 December 2006) [Online Blog Post] Available at: http://eddiecampbell.blogspot.ca/2006/12/alan-moores-london-part-1.html [Accessed 10 February 2013]. Campbell 2006b Campbell, E. “From Hell 10/12” Eddie Campbell Blog. (30 December 2006) [Online Blog Post] Available at: http://eddiecampbell.blogspot.ca/2006/12/from-hell-1012.html [Accessed 10 February 2013]. Campbell 2007b Campbell, E. “From Hell 5/30” Eddie Campbell Blog. (7 April 2007) [Online Blog Post] Available at: http://eddiecampbell.blogspot.ca/2007/04/from-hell-530.html [Accessed 10 February 2013]. Dworkin 1999 Dworkin, C. “Seeing Words Machinewise: Technology and Visual Prosody” Sagetrieb, 18.1 (1999): 59-87. Ellis 2000a Ellis, W. “Come In Alone: Issue #13” Comic Book Resources. (25 February 2000) [Online] Available at:http://www.comicbookresources.com/?page=article&id=13241 [Accessed 7 December 2012]. Ellis 2000b Ellis, W. “Come In Alone: Issue #14” Comic Book Resources. (3 March 2000) [Online] Available at:http://www.comicbookresources.com/?page=article&id=13248 [Accessed 7 December 2012]. Flusser 2009 Flusser, V. “‘The Gesture of Writing’ Manuscript” Flusser Studies , 8 (2009) [Online] Available at: www.flusserstudies.net [Accessed 1 October 2013]. Foucault 1972 Foucault, M. Archeology of Knowledge and the Discourse on Language Pantheon Books, New York (1972). Foucault 1979 Foucault, M. Discipline and Punish: The Birth of the Prison Vintage Press, new York (1979). Genette 1997 Genette, G. Paratexts: Thresholds of Interpretation. Cambridge University Press, Cambridge (1997). Jameson 1991 Jameson, F. Postmodernism, or, The Cultural Logic of Late Capitalism. Duke University Press, Durham (1991). Kay 2013 Kay, N. “Rerun the Tape of History and QWERTY Always Wins,” Research Policy 42.6 (2013): 1175-1185. Kirschenbaum 2008 Kirschenbaum, M. Mechanisms: New Media and the Forensic Imagination. MIT Press, Boston (2008). Kittler 1999 Kittler, F. Gramophone, Film, Typewriter. Stanford University Press, Stanford (1999). Lacy 1946 Lacy, G. “Questioned Documents,” The American Archivist 9.4 (1946): 267- 275. Liu 2004 Liu, A. “Transcendental Data: Toward a Cultural History and Aesthetics of the New Encoded Discourse,” Critical Inquiry 31.1 (2004): 49-84. Marvel Internship Opportunities 2013 “Marvel Internship Opportunities,” Marvel (2013) Available at: http://marvel.com/corporate/interns"[Accessed 16 December 2013]. Miller 2005 Miller, F. and D. Mazzucchelli. Batman: Year One. DC Comics, New York (2005). Miller 2010 Miller, F. and K. Janson. Daredevil Vol. 1. Marvel Comics, New York (2010). Moore 2005 Moore, A. and D. Gibbons. Watchmen. DC Comics, New York (2005). Moore 2008 Moore, A., B. Bolland and R. Starkings. Batman: The Killing Joke . DC Comics, New York (2008). Norcliffe and Rendace 2003 . Norcliffe, G. and O. Rendace. “New Geographies of Comic Book Production in North America: The New Artisan, Distancing, and the Periodic Social Economy,” Economic Geography 79.3 (2003): 241-263. Reichstein 1998 Reichstein, A. “Batman — An American Mr. Hyde?” Amerikastudien/American Studies 43.2 (1998): 329-350. Robertson 2013 Robertson, F. Print Culture: From Steam Press to Ebook. Routledge (2013). Simmons 2012 Simmons, T. “The Scripts.” The Comic Book Script Archive. [Online] Available at: http://www.comicbookscriptarchive.com/archive/tag/scripts/ [Accessed 10 October 2013]. Viscomi 2002 Viscomi, J. “Digital Facsimilies: Reading the William Black Archive,” Computers and the Humanities 36.1 (2002): 27-48. Wershler-Henry 2005 Wershler-Henry, D. The Iron Whim: A Fragmented History of Typewriting . McClelland and Steward, Toronto (2005).